The Battle of Britain was the Nazi’s desperate attempt throughout 1940 to bomb the English into submission in preparation for an eventual landing on British soil. Hitler always had a rather poor understanding of the British psyche and the wave of strategic and terror bombings did little to achieve their desired effect. Rather than cowing the English populace into submission it galvanised them into resistance, civilian deaths were relatively minimal, few targets of military importance were destroyed and Luftwaffe losses were always much higher than that of their R.A.F. counterparts, thanks not only to British air superiority overall but to their smaller faster craft and effective use of radar, which to their detriment the Nazis were never to employ on anything approaching such a grand scale. Operation Sea Lion, the plans for a German sea invasion, were put on hold indefinitely following the Battle and never resumed. The event is undoubtedly the most pivotal in modern British history; had the Nazi’s maintained anything approaching air superiority and been able to tackle the requisite logistical difficulties, the English would have been in for one hell of a struggle. 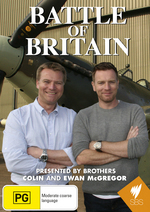 Celebrating the heroes who managed to stave off an invasion of the British Isles are actor Ewan McGregor (the Star Wars prequels, Trainspotting) and his brother Colin, a 20-year veteran of the R.A.F. Together the pair meet the few remaining veterans who took part in the battle, fly historic planes, explore the tactics and technology used throughout and come to a thorough understanding of the importance of the Battle and its present-day legacy. The series is highly enjoyable, deeply informative, occasionally moving and an absolute must for WWII buffs. The brothers McGregor arguably don’t make the best presenters; after all this is the sort of thing better left to specialists, and Ewan in particular elicits more whoops of glee and wide-eyed expressions of the ‘Really? Wow!’ ilk than would seem appropriate, but all in all the pair clearly have a deep fascination with their subject matter, and the end result is a touching and thorough evocation of the key moments when ‘the few’ of the R.A.F. 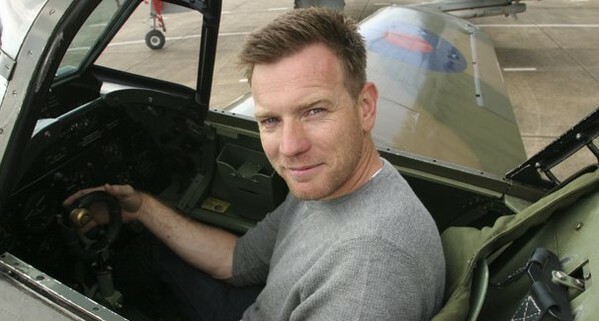 faced the might of the Nazi Luftwaffe.